' Hand Print Snowman Ornament - Sisters, What! 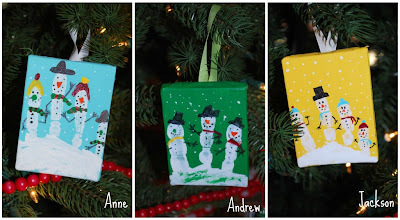 This last weekend the kids and I made some new ornaments for our tree. I am so happy with how they turned out...and I think the kids are too. Jackson takes his off the tree daily and runs around with his then points out Anne and Andrew's ornament on the tree. I love it! I wasn't intending to post about this little project but I posted a picture on Facebook and a few people asked for a tutorial. Well I didn't do a tutorial. I didn't because there is a really good tutorial already out there. Why redo what is already done really well? Right? So go on over to eighteen25 and see what Jamie, Jodie and Jen have to offer. They have tons of fabulous ideas. For the hand print snowman look here. What a cute little idea! So fun for kids! GREAT idea!!! And what a precious keepsake! I don't have enough fingers on one hand for all in my family but I would still love to give this a try! We would love it if you would please link up with us for Fun Stuff Fridays. What a great idea...I love it! I'm your newest follower from the craftomaniac party. I'd love you to stop by my blog if you get a chance & maybe follow along too! That is so cute! Thank you very much for linking to Wednesday Pinterest Favorites :).